Designed for the safe ventilation of bathrooms, toilets and shower rooms, by removing risk of electric shock in wet areas as the fan is mounted remotely. Includes 100mm shower fan with mounting foot, PVC flexible ducting, 2 white grilles with fixing clips, screws and plugs. 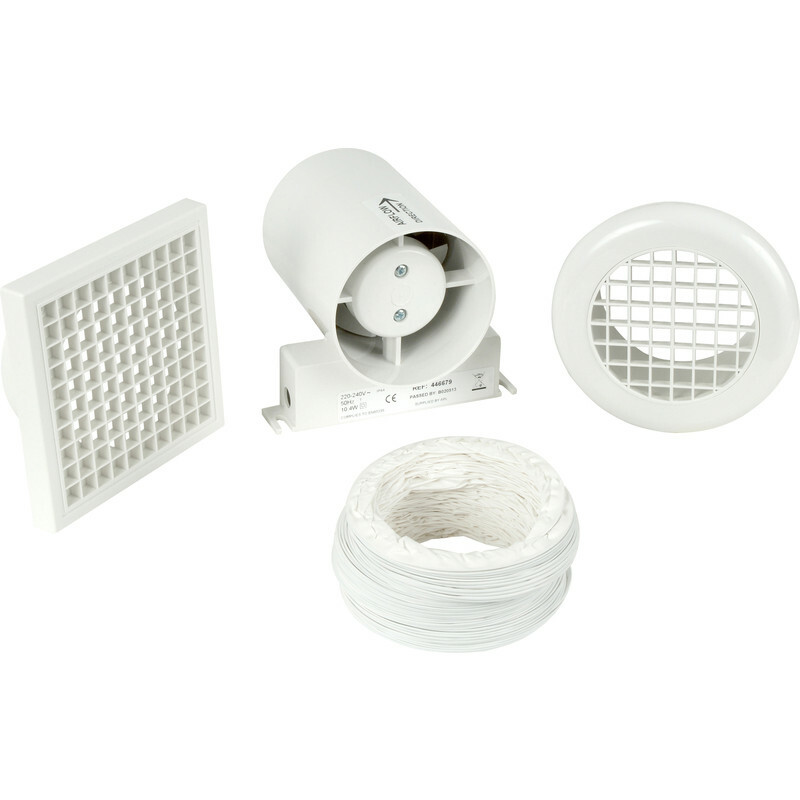 Airvent 100mm Inline Shower Extractor Fan Kit with Timer is rated 3.3 out of 5 by 10. Rated 5 out of 5 by Mike12 from A decent extractor Have fitted a few of these over the years and so far to my knowledge none have failed. A simple, no frills unit that when the inlet vent is located above the shower unit, seems to shift enough damp air. Rated 1 out of 5 by Robertw from Absolutely Rubbish This fan makes a terrible noise, sounds like an aircraft taking off! Wouldn't recommend it at all. Rated 4 out of 5 by Anonymous from Quiet More bits than I needed as I only needed a replacement fan. But the fan works well. Rated 4 out of 5 by nigelg from good extraction rate Very pleased overall. Quick to install. The zip ties to hold the trunking onto the fan were pretty useless as others have said. Can't say how long it will last. Rated 4 out of 5 by Simmo of crosby from Excellent piece of kit Bought to combat damp in bathroom, just need a bit of time to see if it does the job. Nice and quiet in operation, whisper quiet motor. Rated 4 out of 5 by trafficman from Does what it should do. Even being a "non-electrician" it was easy to install.